Years of the Goat or Ram or Sheep: 1931 - 1943 - 1955 - 1967 - 1979 - 1991 - 2003 - 2015. 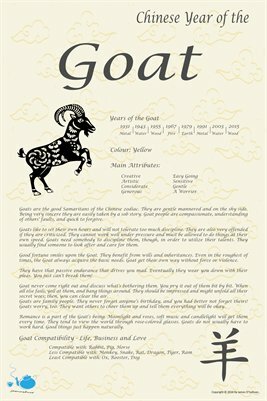 Goats are the good Samaritans of the Chinese zodiac. They are gentle mannered and on the shy side. Being very sincere they are easily taken by a sob story. Goat people are compassionate, understanding of others' faults, and quick to forgive.